‘I have had a disappointment. I had hoped to buy 2 middle sized blankets, to have them dyed violet, to make a warm winter coat, but the person who proposed to sell them, now wants to keep them for herself. Everybody is having blankets dyed, as there are no more stuffs for making clothes. [. . .] I am sadly in want of something warm for winter; three years ago one didn’t dream of providing for 1917, nor of the possibility of the war lasting so long.’ This is from an unusual diary kept a century ago by Mary Thorp, a family governess in occupied Brussels, during the First World War. The diary, as researched by two American academics - Sophie De Schaepdrijver and Tommy M. Proctor - is being published today, for the first time, by Oxford University Press with the title An English Governess in the Great War. Mary, the first of four children, was born on New Year’s Day 1864 to Thomas and Annette Thorp, a lower middle class London family. Thomas was a cabriolet proprietor, and had first been married to Annette’s sister, also called Mary, who had died young - there were several older children from that marriage. In the early 1870s, Thomas took his family to live in Bruges, Belgium, possibly because of friction with his older sons (at least one of whom showed resentment towards their father’s second marriage), or possibly so that Annette could find work as teacher. At the time, Bruges had a thriving ex-pat English community. Although Mary did spend some time in London and in the United States staying with well-off relations, she spent most of her life in Belgium. In 1887, Thorp took her first job as a governess, in the Ghent region, probably because her parents were under financial pressure and she needed to earn her own living. The following year, she took a position with another family, near Bruges. By 1910, she was employed by a very wealthy family in Brussels (headed by Paul Wittouck, owner of the largest sugar refinery in the country) to educate three brothers aged, initially, between 6 and 10. Over time, she became more than a governess, but also a domestic authority within the household; and she also confidently socialised with her employers’ friends and visitors. Even after the deaths of Wittouck (1917) and his wife (1928) she was still registered as living with the family. Thorp herself died in 1945. These details about Mary Thorp and her life have been uncovered by two history professors - Sophie De Schaepdrijver (Pennsylvania State University) and Tommy M. Proctor (Utah State University). Both of them had been using an anonymous diary, kept at In Flanders Fields Museum in Ieper, Belgium, for their First World War research, and became intrigued enough by its detail and richness to want to find out more about the author. The academics consulted population and foreign registers which led them to the name Mary Thorp. Further research helped them piece together aspects of her life. 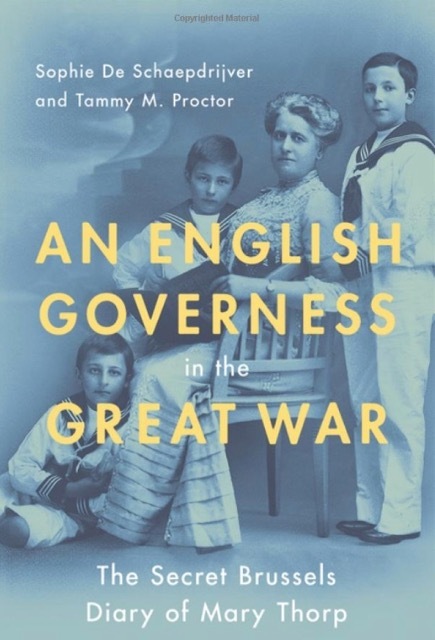 They have since edited the diary, and, today, Oxford University Press in the US is publishing it in hardback as An English Governess in the Great War. (Several pages can be read online at Googlebooks or Amazon). An English Governess in the Great War is handsomely produced, complete with a few photographs, a comprehensive index, many contextual notes and a bibliography. The diary reads very eloquently, as Thorp switches between writing of her domestic concerns, significant dinner guests and their news, anecdotes heard from friends, and her own observations of what is happening around her in Brussels. By far the bulk of the diary, though, is taken up with her own reporting of, and thoughts on, news that she hears or reads about the war across Europe. Her style is informal, warm, intelligent, and gives one the sense of being in her company, and glad of the conversation. She is often quizzical with herself (‘To think we have been to bed & got up thirteen hundred times since the war began!!! & how much longer???’). Also, sometimes, she identifies confidentially with the British war effort by using the ’we’ form (‘Why can’t we prevent the Boches seizing those mail boats!’), although more often ‘we’ is used to group herself among those suffering from the Boche occupation of Brussels. With thanks to Oxford University Press, here are several extracts from Thorp’s diary. ‘Our servant Charles went yesterday to Enghien to get some “precious potatoes;” only had to pay his brother-in-law 1 fr a kilo, lucky man! He says that tram is crammed with potato smugglers, about 30 tons are brought in by it every night, the Germans soldiers who are supposed to search the people let them down very easily & often say “what do we care about potatoes, we know we are doomed to be killed.” On the tram last night, 2 G soldiers, trying to desert, dressed as civilians, were caught. Round about Enghien many desert. Recently, two offered someone 200 frs each for an old suit of clothes, no matter how ragged, to get away in, but the bribed man did not accept - the penalties in such cases are immense, & many people object to the chance of being shot.